It was possibly the worst-kept secret in tablet-land (more so than the iPad), but the final specs have now been revealed for the Samsung Galaxy Tab. It'll run Android 2.2 (Froyo) and comes in a 7-inch flavor—for now. It's one of those moments where the final product actually exceeds expectations based on previous leaks. Sure, a lot of the specs we had heard before, but did you know the Galaxy Tab was going to be the first-ever DivX certified tablet? We're pretty sure there'll be other tablet sizes coming at a later date from Samsung, but this particular GT-P1000 model has a 7-inch TFT-LCD WSVGA screen (with 1024 x 600 pixels), and is powered by a Cortex A8 1.0GHz processor and a PowerVR SGX540 GPU—the same one used in their Galaxy S phone-and runs with 512MB of RAM. As expected, the back-facing camera is a 3MP affair with auto-focus and an LED flash, and the forward-facing one (for video conferencing) has a 1.3MP sensor. In some of Samsung's comedy lifestyle photos below, you'll see that back-facing camera being used for the Layar app. I'm not sure it's going to be any more convenient than using your phone, but it's most certainly a welcome addition. Two storage capacities are on offer, either 16GB or 32GB, with both models allowing for a further 32GB memory expansion via the card slot. As we saw in the leaked video last week, there's a 30-pin connector port, similar to what Apple uses for its gadgets. The one elephant in the room is the fact that Samsung's slicked its TouchWiz UI on over the top of Froyo. I'm not a fan of it on their phones, but will wait until a hands-on session with the tablet before I pass judgment on its usage here. A Readers Hub, Media Hub, Music Hub and Social Hub act as dedicated areas for particular uses—like fancy folders, if you will. In addition to loading up the Android Market, it also has access to Samsung's Apps market for tablet apps. The Gyroscope, Geo-magnetic sensor, accelerometer, and light sensor could provide for some very interesting apps. Update: Head here for our hands-on with the Galaxy Tab. 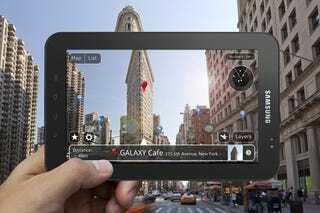 Berlin, Germany, September 2nd, 2010 – Samsung Electronics Co., Ltd, a global leader in mobile technology, today announced the launch of the Samsung GALAXY Tab (Model: GT-P1000). Powered by Android Operating System 2.2, the Samsung GALAXY Tab is the first of the company's tablet devices, representing a new category of mobile products for Samsung. As a new category of device, the Samsung GALAXY Tab brings a wealth of mobile experiences. Its striking 7" TFT-LCD display delivers exciting mobile experience for watching films, viewing pictures, e-reading or sharing documents. In design, its light (380g) build provides perfect portability, with its svelte dimensions making it easy to grip and use. Supporting the latest Adobe Flash Player 10.1, the Samsung GALAXY Tab fully supports swift, seamless viewing of every single page of the web. The Samsung GALAXY Tab will be launched in Europe in mid September, and in other markets including Korea, the US and Asia in coming months. . Readers Hub – Samsung Readers Hub consolidates e-reading applications such as eBooks, magazines, and newspapers. Users can enjoy ‘reading' with unified and intuitive user experience powered by global eReading service leaders, Kobo, PressDisplay and Zinio. More than 2 million books including today's best sellers, over 2,500 titles of magazines in 20 languages and more than 1,600 newspapers in 47 languages are available at launch and will grow the library gradually. Google Mobile Services – Services like Google Maps™ Navigation (Beta) and Google Goggles are available on Google's Android platform. With useful location-based services like Google Maps, consumers can search in Standard English instead of entering an exact address. A search-by-voice function is just as intuitive, meaning searches can also be completed easily on the go. Google Goggles is a powerful, visual search tool that uses the Samsung GALAXY Tab's camera to uncover information – an image of a landmark or artwork is automatically used to perform a search, delivering relevant content like a description or history. In addition, with a camera, users can enjoy various augmented reality services which are downloadable in the application market.